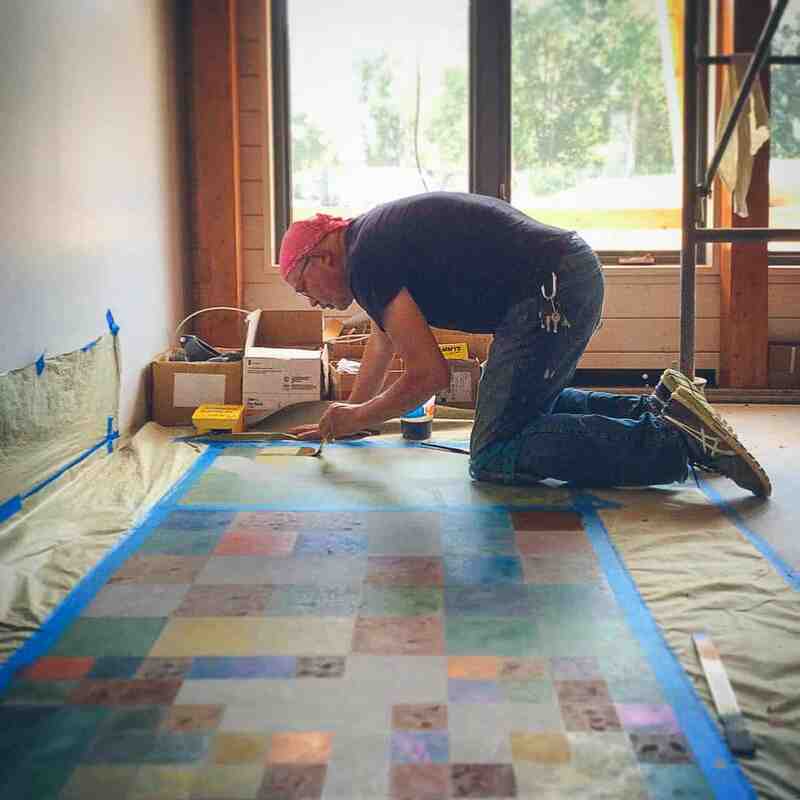 Living Building in Massachusetts features fine art on the floor. 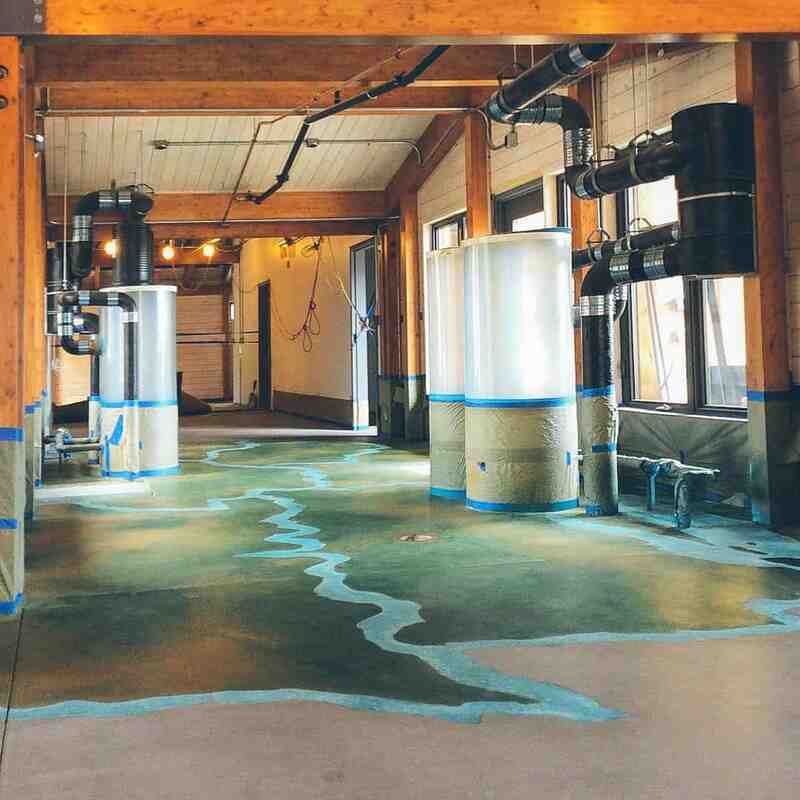 Concrete artists from EnnisArt have taken a standard concrete floor of the recently built Hitchcock Center for the Environment in Amherst, Mass., and turned it into a beautiful depiction of the region’s Connecticut River Watershed. The artistic rendering will do more than greet 8,000+ visitors to the 9,000-square-foot education center every year with its physical beauty; it will also serve to educate and demonstrate responsible water use. It will give visitors “a macro view of their place in the watershed while learning how the Center’s new building acts like a watershed in the design of its net-zero water system,” according to the Hitchcock Center. 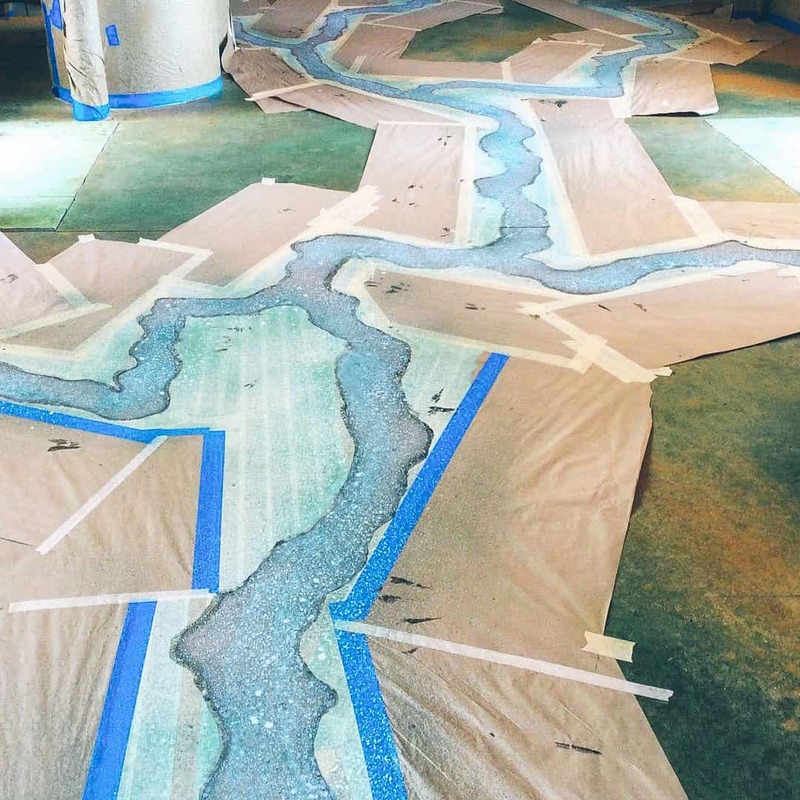 Kelly Haigh, an architect at designLAB, said the region’s watershed directed the way the project’s designers thought about how to make the entire center a teaching tool. The teaching aspect of the ecotone, paired with the decorative map on the floor, helps check off two criteria (beauty and education) of the Living Building Challenge, arguably the world’s most rigorous green building certification that the Hitchcock Center aims to attain within one year of occupancy and energy and performance verification. According to Julie Johnson, executive director of the Hitchcock Center, the organization wanted the plans for the new center to amplify its mission of creating greater understanding and awareness of the environment, generating an emotional bond and connection to the natural world and developing a heightened awareness of the importance of healthy soil, air and water. 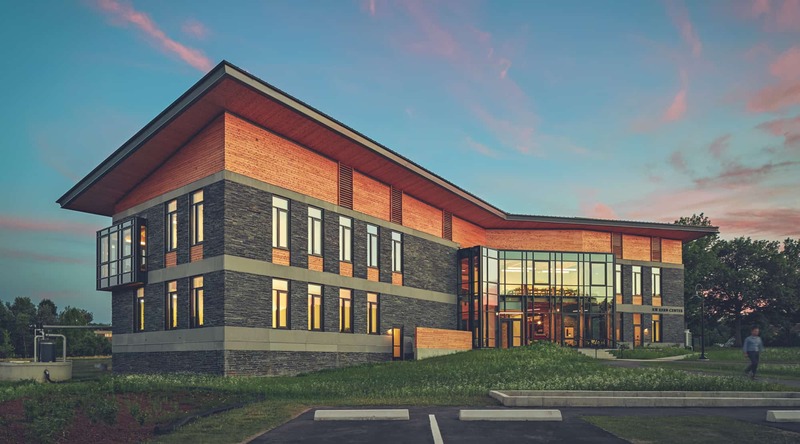 “We learned about the Living Building Challenge… and became instantly excited about the approach and the framework and the philosophies of it and how deeply they thought about sustainability and its performance standards: Net-zero energy, net-zero water,” Johnson said. “We instantly decided, ‘That’s going to be it, we’re going to be the first environmental education center in New England to achieve the Living Building Challenge.’"
Of the Living Building Challenge’s seven petals, or categories of required goals for certification, the beauty petal is the one left intentionally open-ended. For some, an open-ended mission like this one might seem daunting. But it was just the project for the artisanal concrete specialists at EnnisArt of Asheville, N.C. CEO Tom Schulz said he was pointed in the direction of PROSOCO’s Consolideck decorative colors and stains due to their compliance with the Living Building Challenge Red List – a list of chemicals of concern that cannot be used on a Living Building. 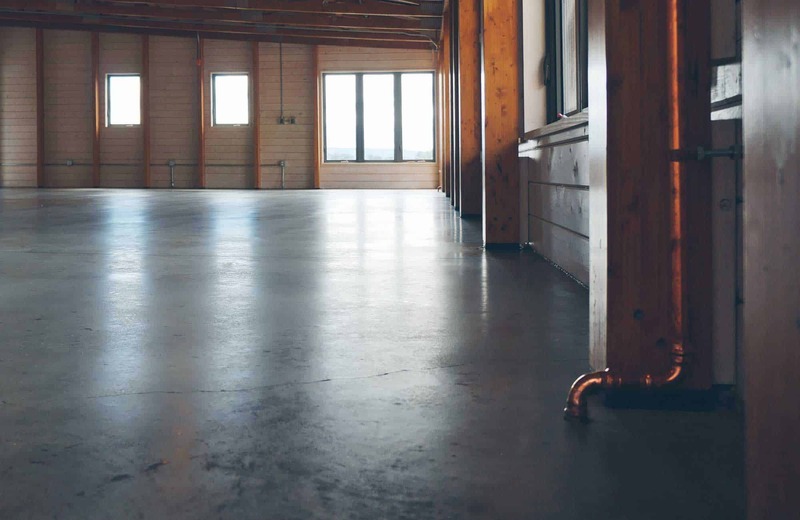 Because Consolideck ColorHard colors (as well as LS/CS, a densifier and hardener, and PolishGuard, a protective sealer) have been verified to contain no ingredients on the Red List, they’re pre-vetted for this and other Living Building projects. 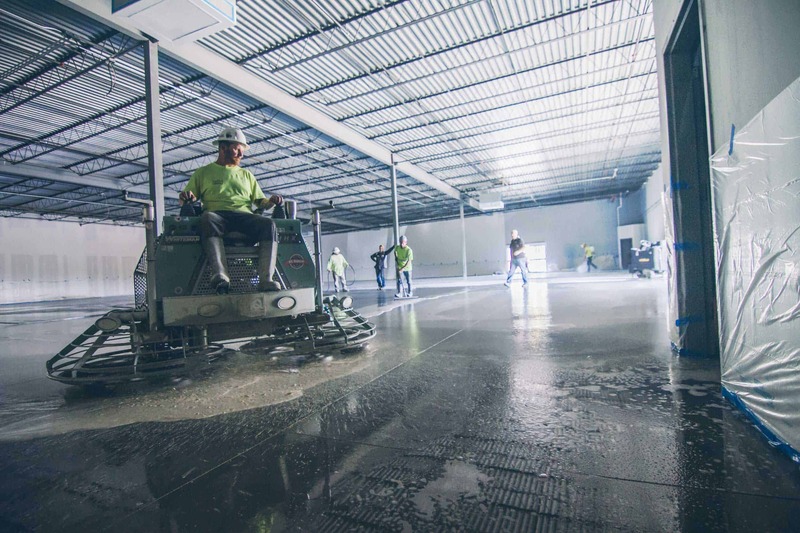 Schulz, along with EnnisArt design associate Daniel de Wit, spent considerable time in their studio perfecting their plan, with help from Paul Smallwood, technical specialist for PROSOCO’s concrete flooring group. But once Schulz and de Wit arrived with their gear in Amherst, they realized that scaling the map wouldn’t mean an exact replication of their testing. 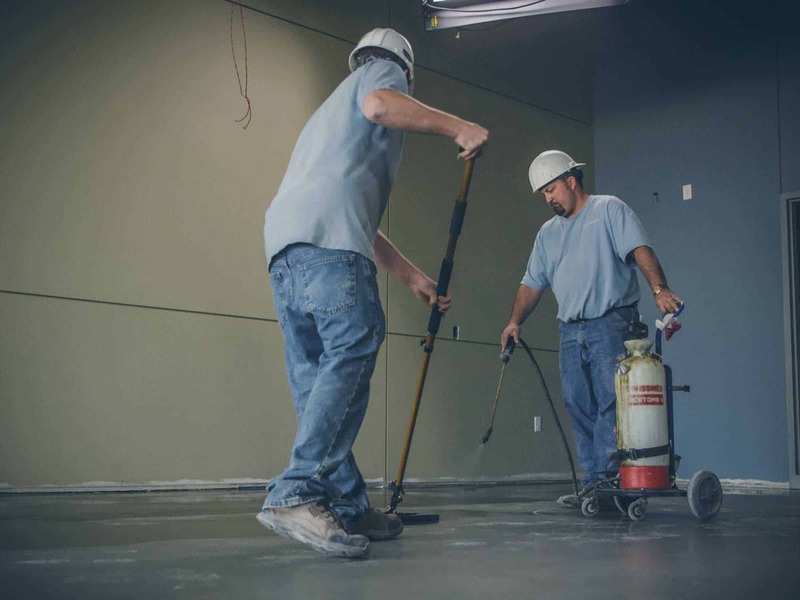 In addition to the colors making up that tableau, the team also used LS/CS and PolishGuard to densify and protect the concrete floor, respectively. De Wit noticed multiple benefits to these products over alternatives, including time savings. On Oct. 1, the Hitchcock Center will open its doors officially to the public with a grand opening event. De Wit will be in attendance to see the artwork in its completed state, a successful manifestation of beauty and education combined. Which Densifier Is Right For My Job?